A minor kitchen remodel can be a good investment for your home. A great thing about small remodels is that they cost less than major remodels. The average cost of a minor kitchen remodel is about $20,000. Most importantly, they add resale value to your home. You can increase your home’s value with resurfaced kitchen cabinets, new hardware and other minor improvements. Remodeling magazine says that small kitchen projects earn a return on investment of more than 83%, according to its latest Cost vs. Value report. A positive thing about minor remodels is that they focus on upgrading existing elements of your kitchen. You can start by updating your countertops with marble or granite. Consider refacing your cabinets. This is a cost efficient option in comparison to completely replacing your cabinets. Revamp your cabinets with glass windows inserts. Inserting textured glass in cabinet door fronts are great for displaying decorative and unique servingware. For storage of everyday plates and dishes, consider installing frosted or etched glass inserts in cabinet doors. Don’t forget about new hardware fixtures. Putting in new knobs and pulls for drawers and cabinets is one of the easiest and cheapest ways to incorporate a kitchen remodel. Adding a kitchen backsplash adds style to your kitchen at an affordable price. This remodeling design typically extends from the counter to the underside of the wall of cabinets. You can even continue around the sink window and on other walls. With so many materials, shapes and style options, you are sure to find the right backsplash to complement your kitchen. Brighten up the kitchen with new lighting. Consider replacing small ceiling-mounted lights for larger or brighter, energy-efficient fixtures that will give off a luxurious feel in your kitchen. Simply adding under cabinet lighting can add brightness to the countertops. Let’s Face It specializes in designing and executing the perfect kitchen remodel in your home. 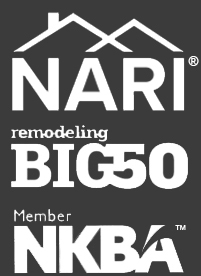 Let our specialists help you plan and design your next remodel. Call us today at (215) 343-2600.